The Denver Art Museum has set a date to begin work on its $150 million renovation plan to expand and update the museum’s North Building. On November 19, 2017, the North Building will close so art can be removed and preparation for construction can begin on November 20. With the North Building closure, the Hamilton Building will be open seven days a week for the first time ever to provide visitors more opportunities to explore the museum. According to the museum, the renovation project includes construction of a 50,000-square-foot, two-story Anna and John J. Sie Welcome Center located where the Palettes restaurant is today. The center will feature a restaurant and cafe, the museum’s primary conservation lab as well as programming and event space. 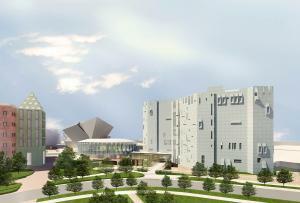 The project will also construct a seventh-floor terrace in the North Building with outdoor access for visitors, expand gallery space for the museum’s design and Western American art collections, create new youth and education facilities and update disabled-access and other building operating systems. Scott Reiman has been a longtime and valued member of the Denver Art Museum community. He has made the Free for Kids program possible and has served as a Denver Art Museum trustee. The Reiman Bridge that connects the Denver Art Museum’s Hamilton Building and North Building is named after him.